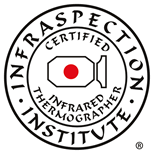 Denver, CO November 12, 2015 – The International Association of Certified Home Inspectors (InterNACHI) has teamed up with Infraspection Institute to provide advanced infrared thermography training for its members. Level I, Level II, and Level III Infraspection Institute Certified Infrared Thermographer® training courses are now part of special training packages available exclusively to InterNACHI members. The income potential for thermographers is significant. Depending upon services offered and rate structure, a single thermographer is capable of generating $250,000 per year in revenue. This potential can be influenced by a number of factors including one’s experience and level of certification. Compliant with ISO and ASNT requirements, Infraspection Institute Certified Infrared Thermographer® courses cover the application of thermal imaging for P/PM, Condition Assessment, Condition Monitoring, Quality Assurance, Forensic Investigations, and Building Sciences. Taught by highly-experienced certified thermographers, courses cover infrared theory, heat transfer concepts, equipment operation and selection, standards compliance, image analysis, and report generation.